On Sale Now! Free Shipping Included! 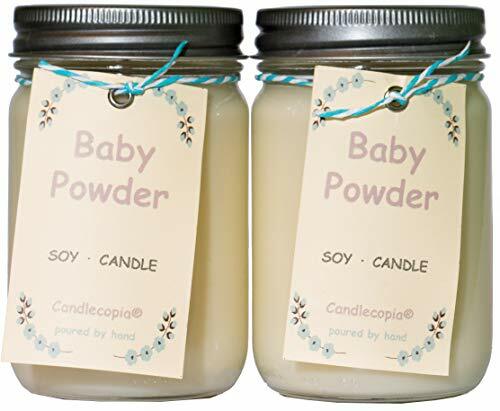 Save 2% on the Candlecopia Baby Powder Strongly Scented Hand Poured Premium Soy Candles, 12 Ounce Pewter Lid Canning Jar x 2-Pack by Candlecopia at Animal Backgrounds. MPN: JAR-BABYPOW-2P. Hurry! Limited time offer. Offer valid only while supplies last. We think you'll really like Baby Powder - This classic powdery fragrance of citrus, vanilla and lavender evokes memories of freshness and tenderness. We think you'll really like Baby Powder - This classic powdery fragrance of citrus, vanilla and lavender evokes memories of freshness and tenderness. All Candlecopia products are made with care in the U.S.A by folks like you, who really like candles and who care about the environment. Our products will fully melt and will abundantly throw fragrance for many, many hours. Candlecopia is a Service-Disabled Veteran-Owned Small Business (SDVOSB) and a Women-Owned Small Business (WOSB). Please try our product and leave your feedback. DIRECTIONS: Place on heat and stain resistant surface. Trim wick to 1/4' before lighting. Allow wax pool to reach perimeter then extinguish after and allow to cool. Discontinued use when 1/2' wax remains. WARNING: To prevent fire burn candle within sight. Keep out of reach of children and pets. Never put on or near any thing that can catch fire.